How many calories in Raspberries? Raspberries are naturally low in calories and fat. See below, the Raspberry calories for the different serving sizes. We provide you with the Raspberry nutrition facts and the health benefits of Raspberries to help you to lose weight and eat a healthy diet. Raspberries taste delicious, they are sweet and almost melt in the mouth. They will make a great addition to your diet. Raspberries are a rich source of fiber and vitamin C, and have a lot of other properties beneficial for our health. Raspberries rank near the top of all fruits for antioxidant strength. 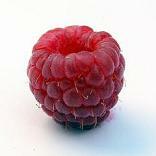 Most of the raspberries calories come from carbohydrates. Below we have several calorie tables covering different varieties including frozen and canned. See our fruit calories comparison chart to compare calories in Raspberries with the other calories in fruit. Read about Raspberry nutrition. Also, have a look how nutritious Raspberries are in comparison to the other fruit nutrition facts.